You can learn to turn in flat, shallow water or on small waves. Skimboarding is a fun way to ride the waves and it's a lot easier to learn than full-blown surfing. 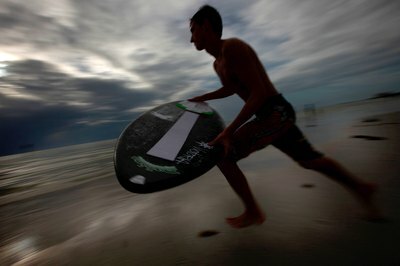 Skimboarding uses a smaller board that uses your momentum to travel quickly through shallow water. Once you've mastered dropping the board and getting it moving, you're ready to learn how to shift your center of gravity around to kick the board in the direction you want to go. Run toward the water, at a slight angle to the beach. Drop the skimboard a foot or two in front of you once you reach the edge of the water. Land on the board with both feet facing the side of the board and with your back foot as close to the back edge of the board as possible. Bend your knees slightly. 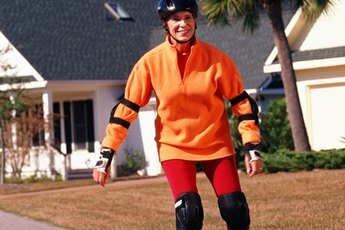 Keeping your knees bent maximizes the amount of control you have over the board. Lean your shoulders in the direction that you want to turn. Kick your back foot downward to begin the kick turn. At the same time, shift your body weight backward and in the direction that you want to turn. The skimboard will turn in the desired direction. When you reach a wave, turn in the same direction the wave is traveling to ride the wave and gain momentum. Alternately you can turn straight into the wave to launch yourself into the air and try to perform a trick.